Statler Hilton Hotel, 1956 – SAVED! The Statler Hilton Hotel in Dallas is one of 12 sites that Preservation Texas, Inc. has named to its tenth anniversary retrospective list of Texas’ Most Endangered Historic Places. Originally named to the 2008 list of Texas’Most Endangered Historic Places, it is designated as a saved site on the 2013 list. Preservation Texas officials announced the selections on the steps of the Texas State Capitol on Preservation Day, February 20. The annual announcement is part of Preservation Day activities organized by Preservation Texas. Advocates from all over the state come to participate in informational sessions, meet with legislators at the Capitol, and get an in depth look at lessons to be learned from the sites named to the list. Completed in 1956 at a cost of $16 million, the Statler Hilton Hotel stands 19 stories high and included 1,000 guest rooms and a ballroom that could accommodate 2,200 standing. The architect, William Tabler of New York, designed a Y-shaped building that employed a flat-slab structural system, the first full application of its kind. The hotel’s sheer size, bold form and exuberate blue panels made it an icon of mid-century Modern design. When the building received its Texas’ Most Endangered Historic Places designation, it was vacant, underutilized and unappreciated. The main factor in saving the building was a loud outcry from the preservation community. Preservation Dallas worked to educate the public, city council, and staff about the importance of the building to Dallas’s architectural history, and why it needed to be saved. That effort was bolstered by endangered designations by Preservation Texas and the National Trust for Historic Preservation who helped call state and national attention to the building and its importance as an outstanding example of mid-century Modern design. The publicity and advocacy effort attracted outside developers, as well as local prospects, to give the building a second look. The Statler Hilton is now owned by a private developer who has cleaned out the building, removed hazards, and repaired the façade. He also has created a model residential unit to show how the building could be converted to residential use. 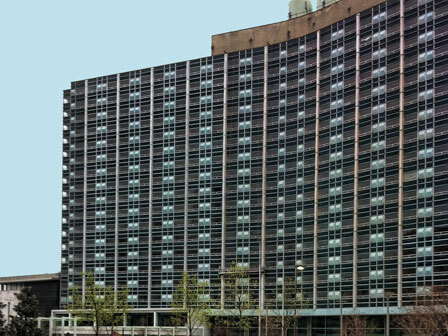 Saving the Statler Hilton is significant for the preservation community because it shows cities that it is possible to preserve and re-purpose large, post-World War II complexes successfully. It was also important for Dallas because it preserved what is believed to be the downtown’s best block of mid-century modern architecture.